By popular request, here is how my sewing space is organised. The table top is made of two layers 18mm thick MDF, so it can take 20kg of a cast iron sewing machine lowered into it, with all the vibrations of the moving parts. 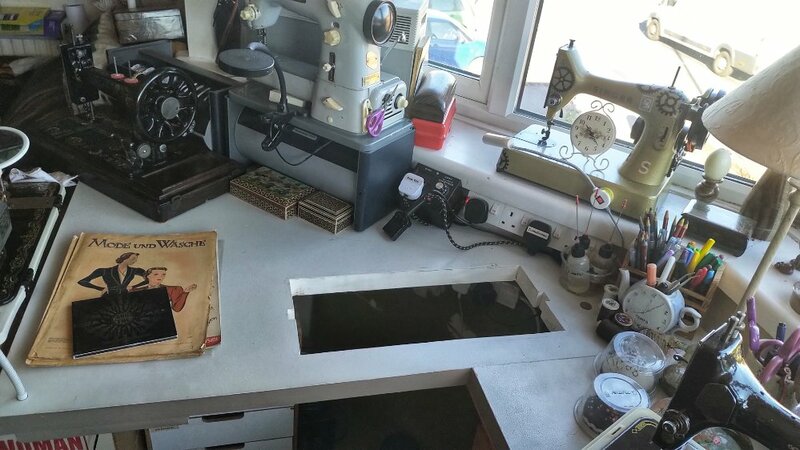 As you see, the front ledge is also quite narrow – only 6cm – a fraction of what you get in a treadle. This hole takes full size machines like Singer 27, 66 or 15, in standard plastic cases that measure 44cm in length, not including the ledge (there are some similarly looking cases that are longer). The cases have a ledge that keeps them firmly in their place. 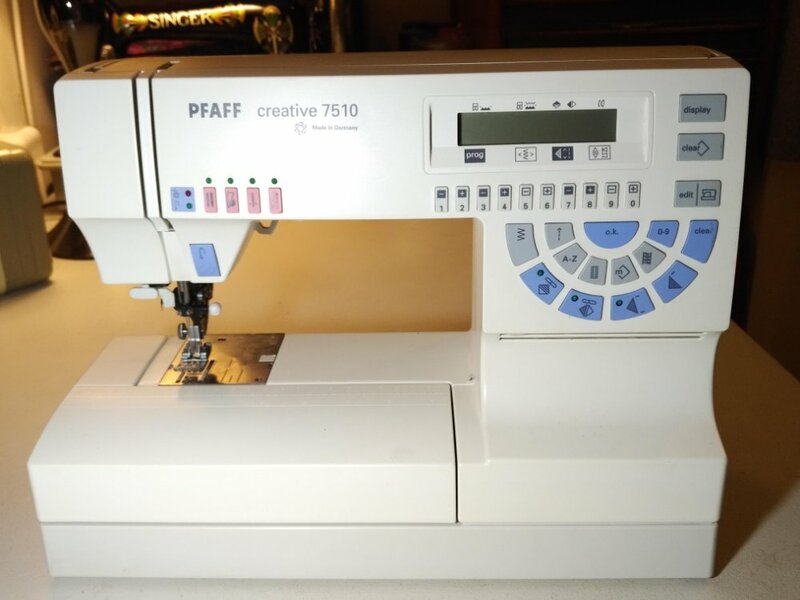 I equip all my machines with the same type of motor: Sew-Tric with a 4-pin connector, so that swapping out machines is really just a matter of unplugging and lifting out. These motors also can have a light mounted onto them – very useful. They take standard B15 fitting bulbs, and I buy super bright LED corn bulbs. It is a simple household unit, but it does the trick. The numbers on the display only really make sense when you are pulling current through it. Note that the knob doesn’t go beyond 220V which is ideal for my old motors – they run just that little bit smoother. The LED light appears to be rated for 110V-240V because it keeps shining at the same intensity at all these voltages. Below 110V the motor is not getting enough juice to rotate. 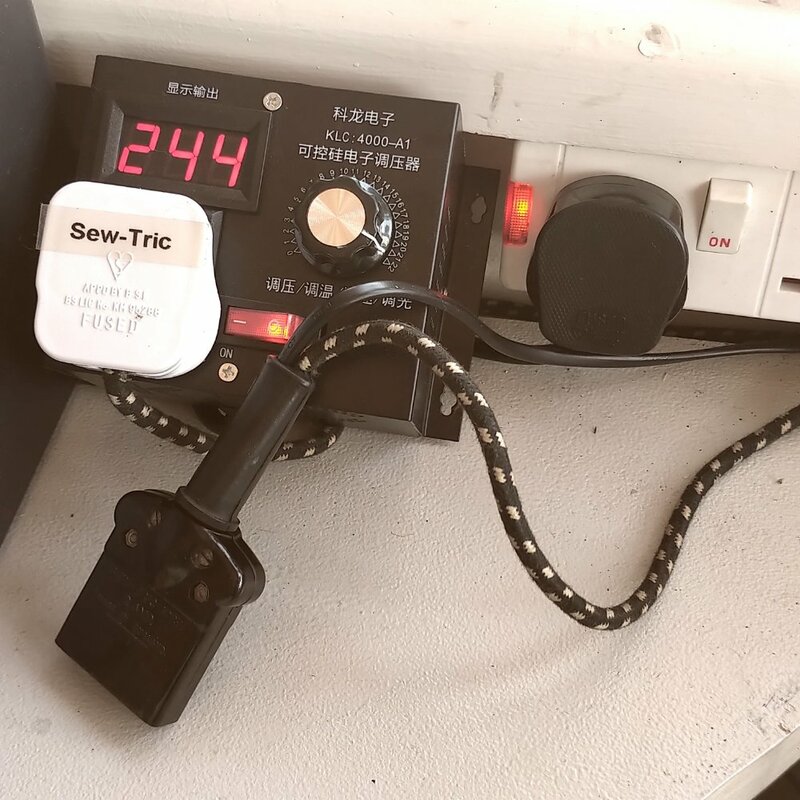 I found 180V-190V to be a good setting for going slow but not really at a crawl, and 130V-150V works well for stitch-for-stitch sewing – very slow even with the pedal pressed firmly. At such speeds the motor may struggle to start sewing though, if the machine is a bit stiff going. So, this is the space and provisions for flat bed machines, and what about free arm? I hardly ever need a free arm, is the answer. It is really not difficult to sew sleeves on a flat bed machine. In tight places you would really rather need a vertical post, not a transverse arm. However, in some very rare cases a free arm can be useful. And more importantly, it was so very popular in 1960s, that most machines had it. 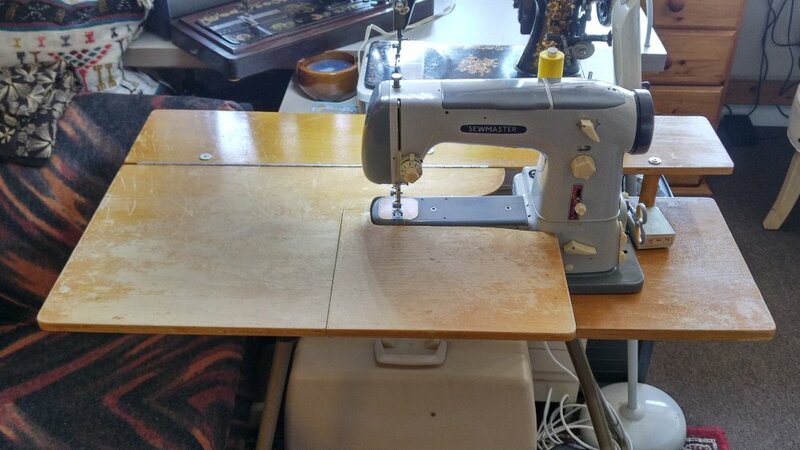 Of course you also needed an extension table for regular sewing, so in 99.9999% of cases you were fiddling with it rather than using the free arm. I was lucky to find a table especially designed for free arm machines – making them into flat bed machines again. In late 1970s the free arm became lower and wider (and completely useless), so the space around it was now filled with a storage compartment making the machine into a portable flat bed – the same design as we see today. This is still not that good for serious sewing though because of the 10cm drop from the sewing platform to the table. You cannot lay flat your work, it pulls and interferes with the stitching. Free arm was actually better. 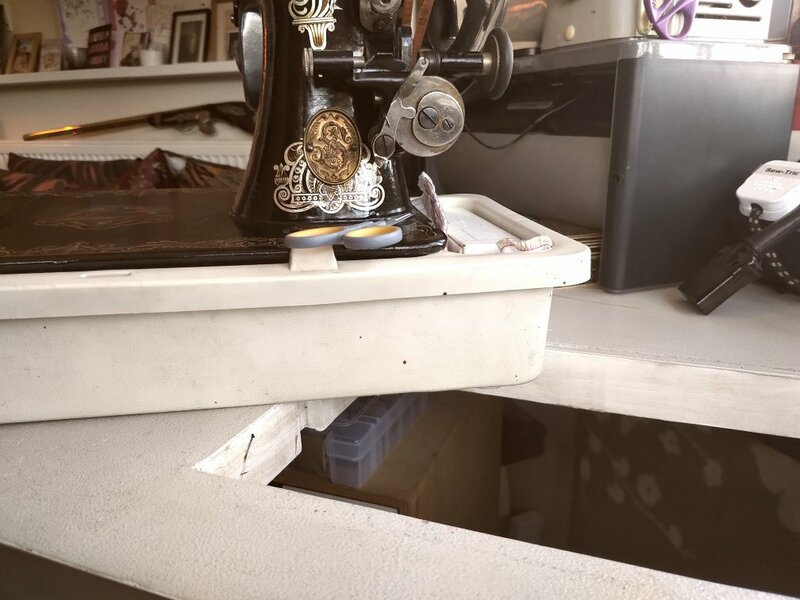 So of course we see sewing cabinets with especially shaped extension tables that allow you to convert your machine into a proper flat bed. I haven’t got any of those – no room. 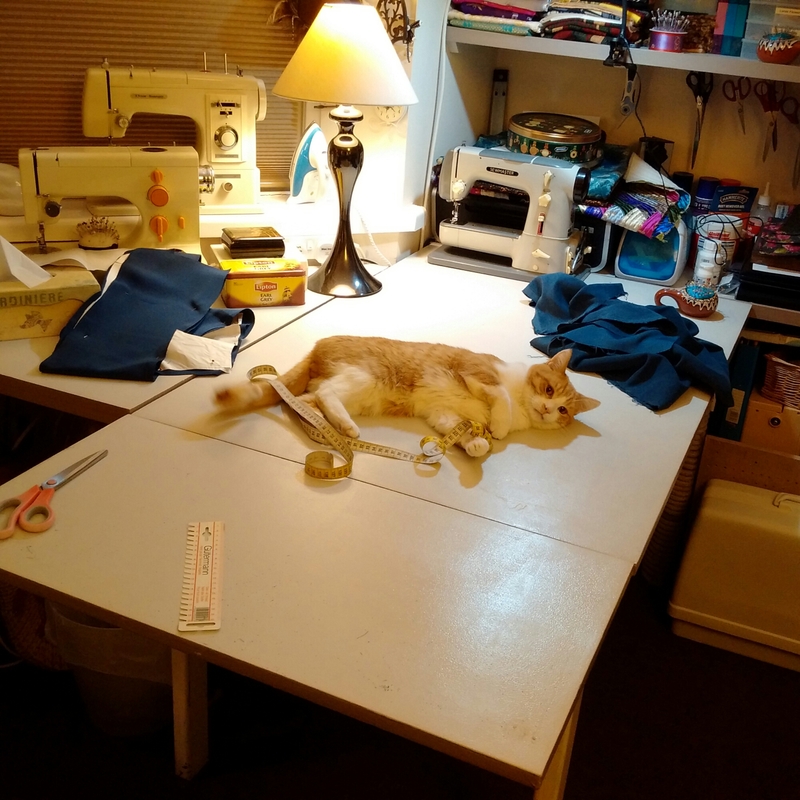 To the right of my main sewing table is the overlocking table. It is a narrow desk – only 60cm deep. There is just enough room to the left of the overlocker to put down the work. I also use this space for special purpose machines, like when making buttonholes. To the right of the overlockers is the second triangular surface running along the bay window. Next to it is our dining and general purpose table – it gets used for everything. It has extendable leaves – I usually open one for cutting material, but both can be used for particularly large projects. Thanks for all the details. I now understand how that corner is trouble for treadle machines and can see how standardising motors on the flat bed machines allows a quick change-over. I like your standard plastic bases – presumably you just have to keep a look-out for old used ones? Some machines – Jones’ Spool and Necchi Julia for example are a bit odd, so don’t fit a “normal” full size cut-out My home made sewing table has all sorts of cut-outs in odd places to accommodate those machines, but I can see your method can overcome that issue by modding just the plastic base. I didn’t appreciate quite how multi-functional your space has to be. 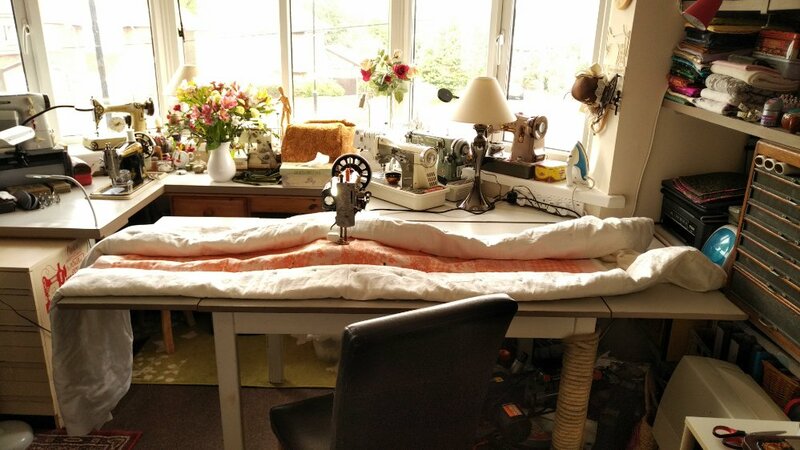 You’ve worked wonders and I realise I’m very lucky to have space for a big, square sewing table. Still, until I get rid of some machines it still has to have a load of stuff under it! So these “Janome” plastic cases that I use, came in two types: hard plastic and soft resin. Hard plastic ones have a traditional rotating clip to hold the machine in place, so they never damage the paint. I prefer them for all properly standard machines based on Singer full size. However, they are fragile and when sent with a heavy machine in them and not properly secured, they often arrive damaged, sometimes beyond repair. So I prefer to buy them separately when I see them. The soft resin cases are of the same size but the clip is just a moulded thing that fits very snugly against the edge of the bed and slightly over it. It works fine to keep the base fixed to the machine, but when you want to flip the machine back for oiling, you have to forcefully tilt it back and the clip scrapes against the paint – not great. :-p However, because this is resin, they survive postage quite well, and most importantly – they can be easily modified. My Jones Spool, Necchi Supernova and German VS2 machines are all slightly too large, but I could adapt the resin cases for them, and now they all quite happily fit into the cut-out in the table. Another nice property of these cases (of both types, and also the smaller Singer ones) is that they have good solid lids with fairly flat tops – not like the bentwood cases, so these plastic ones can be stacked. And yes, the lids take another 20kg on top of them easily. That is certainly one very organised space! Nice to be able to glance out of the window occasionally perhaps, and to have the natural light from it. I applaud your use of space! I love seeing other people’s work spaces, I feel like you can learn a lot about people that way. Whenever I feel like moaning about how cramped my workspace is, I’ll have to remember this post! What a space! 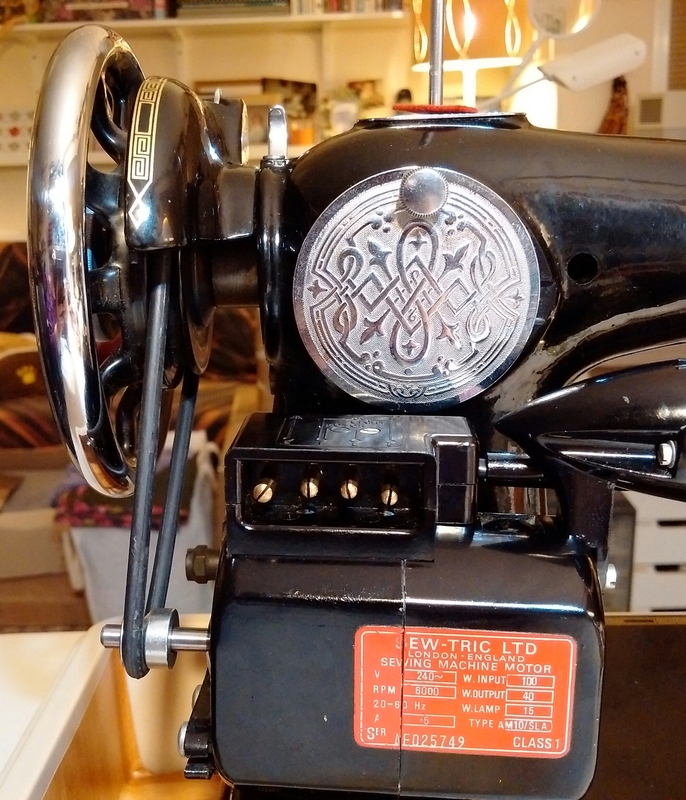 I bet you stand at the door and take a moment to take in all the antique sewing machine delights. I loved the kitty with the tape measure! Thanks, Tierney, but I don’t think of my machines as “antique” although some of them technically are (over 100 years old). But they are not here to be on display, they are here because they work well – better than the modern ones, even from the Professional range at £6,000 straight stitch only.